Shopify Users:If you are a Shopify users we will automatically track abandoned carts for you. Simply head to Triggered Notifications and click on the abandoned cart notification template. You can edit the notification information and then activate it by clicking "Activate"
Place the following snippet on your cart page. Here you can define how long (in minutes) before a cart is deemed abandoned from a visitor. In the example below, we determine that a cart is abandoned if it has not been completed within 30 minutes. Place the following snippet on your order complete/ thank you page. If any subscriber adds a product to your cart and does not complete the order within the time specified in step #1, an event "Abandoned Cart" will be triggered for that subscriber. You can view the "Event Logs" within the Aimtell Dashboard to see records of these events. Specify the push notification message you want to send to abandoned carts. Specify the trigger for the notification. The category should be "Cart" and action should be "abandoned". Click activate and you're all set! 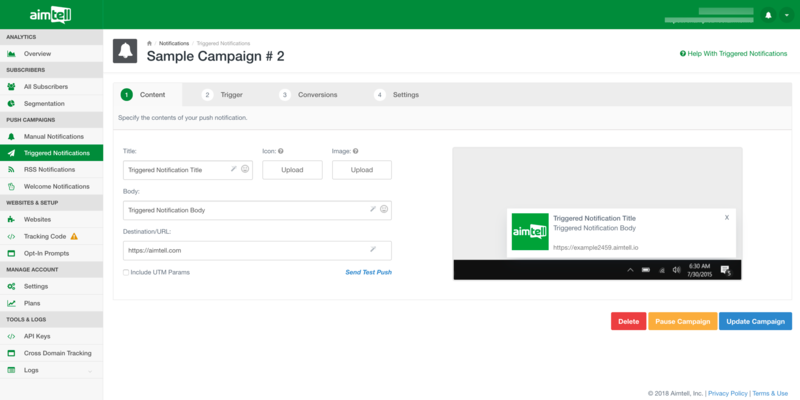 You can view the results of the campaign by going to Triggered Notifications and clicking "View Results" next to your campaign.